The Childrens Class gathered paper products and cash donations to help flood victims. This mission project helped financially support a Super Summer Collegiate Staff Member. 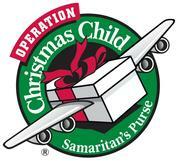 Operation Christmas Child collects shoeboxes filled with gifts and delivers them to children in need around the world. Every one of these shoebox gifts is an opportunity for the Gospel. This class continues to collect codes to earn money for missions. Please place them in the box on the table in the foyer.